Thank you for your interest in ICAN Seattle. ICAN is a volunteer based support network for parents who have experienced a cesarean delivery, whether planned or unplanned. We meet for in person support on the 2nd Monday of each month, from 7-9pm, at OneLife Community Church 3524 NE 95th Street Seattle, WA 98115, on the upper level. Our current coleaders are Marcia and Jennifer. Jean is currently in the process of working toward leadership. Our Facebook group can be found here. If you request to join, please check your message requests. You will receive two messages from Jennifer. For those of you new to our community, welcome, and for those of you who have been around a long time, welcome back! First, we found a NEW MEETING SPACE. We are still meeting on the 2nd Monday of each month, 7-9pm, but our new location is at OneLife Community Church 3524 NE 95th Street Seattle, WA 98115. Second, we are pleased to announce the addition of 2 additional co-leaders, Mary Kachel and Rosanne Greenway. Rosanne and Mary are excited to support moms in their journeys. Sharon and Marcia will continue on in their leadership roles. Finally, if you have appreciated the support you have received from ICAN-Seattle, we encourage you to join ICAN. The International Cesarean Awareness Network, Inc. (ICAN) is a nonprofit organization whose mission is to improve maternal-child health by preventing unnecessary cesareans through education, providing support for cesarean recovery, and promoting Vaginal Birth After Cesarean (VBAC). If you indicate that you are a member of ICAN-Seattle, a portion of your dues will come back to our chapter. 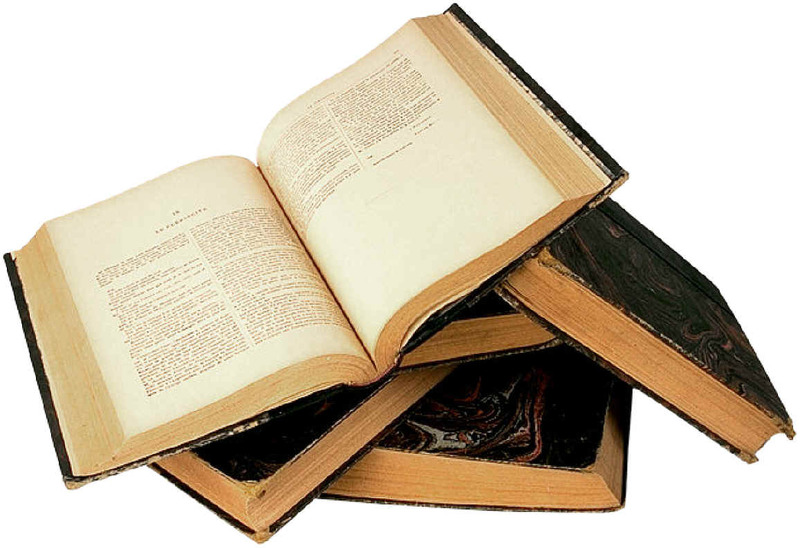 We use those dues for numerous things including the purchase of books for our library and for outreach and support. Thanks so much for your continued support. Looking forward to seeing everyone at our November meeting. 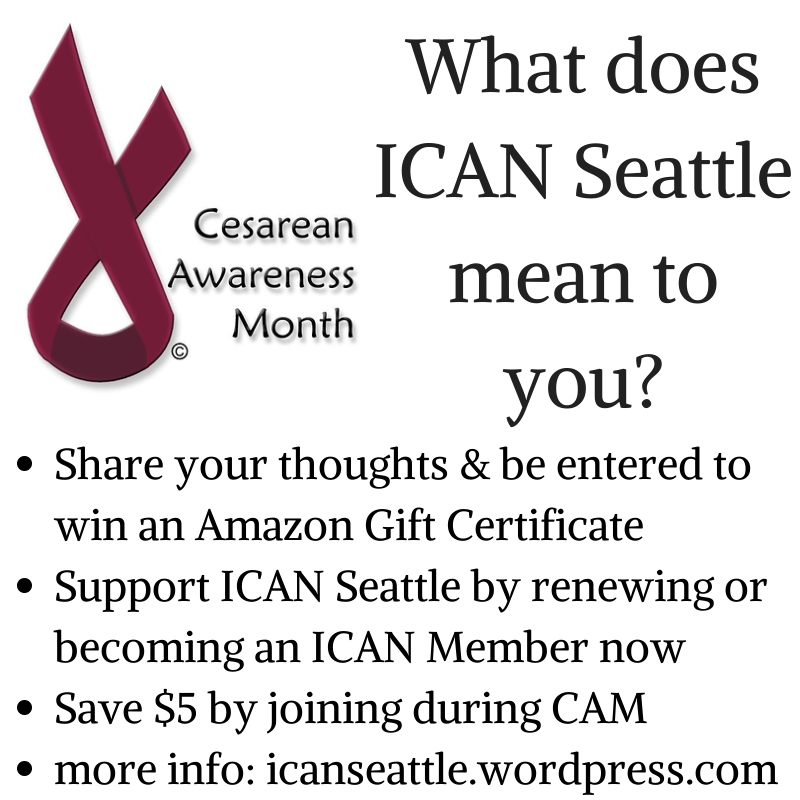 April is Cesarean Awareness Month and the ICAN Seattle chapter would like to hear from you. Send us a brief statement about what ICAN and ICAN Seattle have meant to you during your childbearing journey. All entries received during the month of April 2014 will be entered to win an Amazon.com gift card. Your submission provides ICAN Seattle with the right to use your statement and initials on our website or marketing materials. Additionally, show your financial support for our local chapter as well as the national organization by renewing or becoming a member of ICAN! The Seattle Chapter benefits financially from every membership purchased. During CAM, you can save an additional $5 off the normal $30 membership. Please, if you have enjoyed the support of ICAN/ICAN Seattle, consider becoming a member or renewing now. ICAN Seattle Wants YOUR Birth Story! Help ICAN Seattle celebrate Cesarean Awareness Month this April by sharing your birth story! April is Cesarean Awareness Month, and this year ICAN Seattle would like to honor this month by posting your birth story on our ICAN Seattle blog! Our goal is to have one story for every day of the month in April. What are we looking for? Your cesarean story, your VBAC story, your CBAC, your HBAC, the stories that we all read and learn from, rejoice in or share in the challenge and struggle. Your identifying information can be included or removed, as you feel comfortable. Include a picture if you like. During the month of April, a new story will appear everyday. Tell us how ICAN helped you before, during or after, what you learned from this experience, some of your proud moments, some of your challenges. Each birth story in unique and needs to be heard and honored. These stories will unite us as a community of women supportive of birth, informed choice and learning how to birth on our own terms! Please, take a moment to send along a story that is already written, or take time to write your birth story down, if you have not yet done so. Email your story to ICANSeattle and watch in April as we celebrate and honor the strong and courageous women in our ICAN community! International Cesarean Awareness Network just released a lovely video on “What Is ICAN?” and we wanted to share it here! This completely volunteer organization is making an impact every day on women’s lives all around the country! We see it here in Seattle at our monthly meetings and on our active listserve. Together, women helping women with information and support, we can change the face of birth. Watch this short little video and leave a comment about what ICAN means to you! International Cesarean Awareness Network just called attention to a research study that finds that VBA2C is just as safe as repeat Cesarean surgery. This could potentially be a big issue, as it is very difficult to find a provider willing to support a woman trying to have a vaginal birth after two (or more) cesareans. Many of the Seattle ICAN women have searched high and low and run into dead end after dead end, getting very frustrated and discouraged along the way. A systematic review and meta analysis of the medical research on vaginal birth after two cesareans (VBA2C) found that there is no statistically significant difference in key maternal and infant outcomes between VBA2C and repeat cesarean (RCS). Follow this link, to read ICAN’s press release and then continue on from there to read the ICAN white papers on Vaginal Birth After Multiple Cesareans. Use our yahoo group and monthly meetings to share what you learn, if you are on the path to have a VBAMC! At Least You Have A Healthy Baby . . .
Gretchen Humphries wrote a great essay on this very topic. It is a good read! For more essays by Gretchen, check out her website Birth Matters. You should be grateful, after all, you have a healthy baby. That phrase (or the similar, “All that matters is a healthy baby”) did more damage to me than anything else said to me after my cesarean section. Because on the face of it, it seems so true. My husband and I had struggled with infertility for several years. My pregnancy came after at least 2 miscarriages and drugs to make me ovulate and then to maintain the pregnancy. I had beautiful twin boys. Why was I so upset? Wasn’t I grateful? They were apparently healthy and so was I, if you discount the physical devastation of major abdominal surgery on top of the exhaustion taking care of newborn twins brings with it. My recovery was, after all, uncomplicated by medical standards. Physically, I was healing well. Wasn’t I grateful? So many people said it to me, I started to wonder. People I trusted, people I respected, people I loved. Women that had cesarean sections for their children and trumped the advantages of it. Maybe I wasn’t grateful for my babies? Maybe I didn’t love my babies as much as I should or as much as other mothers did? Maybe I was being selfish and petty to be so upset about the birth and not blissfully happy with my babies—after all, other women seemed to “get over it” so quickly—so quickly in fact that I had to wonder if I was really crazy to think there was anything to “get over.” What was the big deal? Part of the problem was that I actually didn’t feel overwhelmingly grateful, nor did I feel overwhelmed with love for my boys. I knew that if anyone threatened them in any way that I’d do anything to protect them. I’d already proven that in negotiating a less traumatic cesarean than they would have normally experienced. I could protect my children but I didn’t feel a lot about them. I was depressed. So for several months I wasn’t feeling much of anything. It wasn’t hard to believe that I wasn’t grateful enough, that I didn’t love them like I should. But I still had to wonder, even as the depression lifted, why hadn’t I ‘gotten over it?’ What was wrong with me? Then I began to realize how evil it is to tell a woman who’s experienced a physically or emotionally traumatic birth that she should be grateful because when you say that, she hears that she isn’t grateful enough for the precious baby she’s been given. And that cuts to the quick. She may already be wondering what was wrong with her that she couldn’t have a normal birth and now you’ve told her that she doesn’t love her child enough. It is evil to say, “All that matters is a healthy baby,” because you are saying that her pain, her damage, doesn’t matter. You are telling her that not only is her body broken, but so is her mind. That if she is physically healthy, that’s all that matters, and to be concerned with anything else is somehow wrong. That the means to the end doesn’t matter, she is expendable. The truth is a woman can be absolutely grateful and full of passionate mother love for her child and be enraged by how that child came into the world. Hating the birth, hating what happened in that cold impersonal operating room or delivery room has nothing to do with the child. It is possible to be both full of rage and full of love. When that rage is turned inward, a woman is depressed, and likely to believe you when she hears you tell her she’s ungrateful and unloving toward her child. And if that rage turns back outward, it will spill over to you, because you told her a lie and she believed it because she trusted you. If that rage stays hidden, it will fester, and eventually there will be a place in that woman’s heart where she no longer goes, because it just hurts too much and makes no sense. Good mothers just don’t have those feelings, and she’s already afraid she isn’t a good enough mother. And so she loses something precious, and so do we all. I was freed by the knowledge that there is nothing wrong with me! I underwent the surgical removal of my children from my body—a procedure that has nothing to do with birth, that completely circumvents what my woman’s body is made to do. If it felt like an assault, then it was an assault, a very sexual assault. And if I’m not upset about being assaulted, then there really is something wrong with me. And that nothing that was done to me has the power to keep me from loving my children with passionate mother love. I am grateful, grateful beyond words for the blessing of my children. They are miracles. The day they were taken out of me was one of the worst days of my life. Yet I am grateful for them, though not for what was done to me. My physical body might have recovered well enough to be called ‘healthy’ but my spirit was deeply wounded and then neglected. I was not healthy. I know my children suffered because of that. I have a lot to be grateful for but not for their birth, never for their birth. Understanding and accepting that makes me truly healthy. Admitting the horror of their birth frames the love I have for them in a way that astonishes me—-amazed at what I went through because of my love for them, I now know I really would die for them if needed. Now, when you tell me that I should be grateful, I realize that you are showing me how frightened you are. That you are afraid to look at my pain. That you are afraid to admit that maybe I have good reason to be angry, that maybe women are truly assaulted in the name of birth. You are telling me that it’s okay for women to have birth ripped from them, that it isn’t acceptable to look for a better way or to mourn what was lost. I know you now. You may not know yourself, but I do. And I pity you. More On Breech Birth . . . Could There Be Change Afoot? For those of us keeping an eye on what is happening with breech birth these days, there are hopeful signs that vaginal breech birth may become a more accessible option once again. We blogged about the new guidelines put forth by the SOGC (the Society of Obstetricians and Gynaecologists of Canada) last week, but wanted to follow up. We hope that ACOG is paying attention to what their colleagues to the north are saying and doing. Please read the SOGC guidelines, as well as the commentary from Dr. Andrew Kotaska. The guidelines state that “planned vaginal delivery is reasonable in selected women with a term singleton breech fetus”. Dr. Kotaska, one of the authors of the guidelines, points out in his commentary that over 100,000 women have babies that are breech at term, and that with reasonable and conservative practice guidelines, over 25,000 of these women (and babies!) could avoid cesarean and have their babies vaginally instead. WOW! And imagine up to 25,000 women that wouldn’t have to navigate the politics of a VBAC. In case you think this estimate is being pulled out of a hat . . . check the PREMODA study, which trumps the (in)famous Term Breech Trial study. You can read the abstract and summary of the PREMODA study here. The Term Breech Trial has been widely criticized for major study design flaws and conclusions, though it was at one time considered the definitive study on cesarean vs. vaginal breech birth. Lots to look up on this one. Well, here we are. Women’s voices are finally getting heard – the Society of Obstetricians and Gynaecologists of Canada has issued new breech guidelines that above all, advise that women need to be offered the choice of vaginal breech birth. What is the most important about these guidelines is not the nitty-gritty of candidate selection and techniques of delivery, but rather that they have tackled the ethical issue of forced surgery and come down firmly on the side of not obliging women to have surgery they neither want nor need. For those of you not in Canada, this is a great opportunity to approach your own organizations and present this example of progressive movement towards recognizing women’s autonomy over their own bodies and ownership of their birthing. However, as always, the real change must come from us. The real change must come from women and their families expecting better care. Expecting to be offered unbaised informed choice discussions and for our choices to be respected and supported. Expect referrals to competent attendants when our own midwife or doctor legitimately doesn’t have enough experience to safely catch our breech babies. Please. Tell your friends what has happened. Shout it to the rafters. Watch for the Conference registration announcement (it will be October 15-16, in Ottawa), and do whatever you can do to be here. Please contact Christie Craigie-Carter, at International Cesarean Awareness Network (ICAN) for more information about what ICAN and other organizations are doing at the national level to draw attention to this issue and effect change. You as a consumer can make change happen too! Christie, incidentally, had two breech babies by cesarean before having her third breech baby vaginally at home. And lastly for some inspiration and a reminder that breech is a variation of normal . . .here is an amazing photo sequence of a footling breech homebirth in England. Check it out! Think About Keeping Your Pants On! I read a great blog post today by a Certified Nurse Midwife about the usefulness (or actually, the possible emotional harm!) of vaginal exams prior to the beginning of labor. I think this is a great read and good information to take to heart, especially for those women who are having a VBAC. The question I always ask is this…. ‘Will the information gained from THIS vaginal exam change what we are going to do today?’ In your present situation, unless you are considering being induced a vaginal exam is irrelevant. 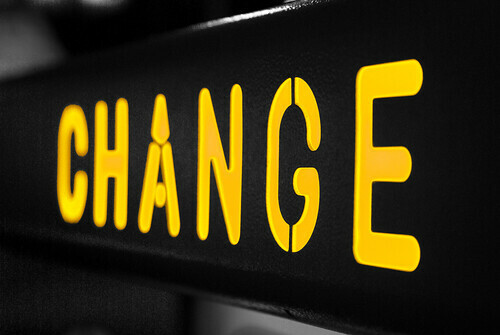 What do I mean irrelevant…it does not change what we are going to do TODAY and things can literally change overnight. Because of this, I encourage you to avoid all vaginal exams until you think you are in labor and are having a labor check or you are preparing for an induction. Head over to this blog and read the entire article! At your next appointment, think about keeping your pants on! Skip This Routine! Oh Canada! Breech Birth Preferred over Cesarean for our Neighbors to the North! “The new decision to offer vaginal breech birth aligns with the SOGC promotion of normal childbirth – spontaneous labour, followed by a delivery that is not assisted by forceps, vacuum or cesarean section. In December of 2008, the society release a policy statement that included its recommendation for a development of national practice guidelines on normal childbirth. One of the challenges will be to find providers who have experience with breech births, as this art has been lost over the years, and the experience and training has been not handed down to the current providers catching babies! Maybe time to call in some old midwives! Maybe ACOG and the US will not be far behind, but until then, a current passport might not be a bad thing to throw in the birth bag!